One of the biggest city in England, host to four universities, has gone blockchain to tackle global warming with the aim of reducing overall carbon emissions by 40% by 2030, Trustnodes is told. Liverpool City Council has signed a partnership agreement with The Poseidon Foundation to trial their blockchain solution over the next 12 months. “Liverpool City Council has a significant carbon footprint because of all the services we provide – be it street lighting, the running of countless properties like St George’s Hall or the Arena and our fleet of vehicles. 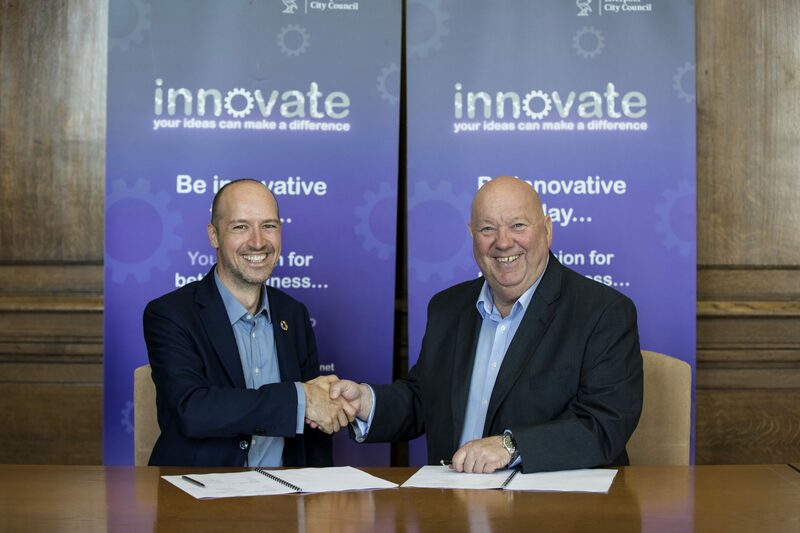 Joe Anderson, Mayor of Liverpool on the right and Laszlo Giricz, CEO and founder of the Poseidon Foundation. Climate change or global warming might be something you’ve heard on TV and maybe you even have an opinion on it, but what you might have not heard much about is carbon credits. Carbon dioxide increases the atmosphere’s ability to trap infrared energy. Some other gasses decrease it. That balance is changing because carbon emissions are increasing, which means temperatures may rise potentially to the point of inhabitable. A global cap on the amount of carbon that can be omitted, therefore, has been set with some 170 countries agreeing to it. The way that works is that everyone gets a set amount of carbon they can emit, or more correctly the government does. If you exceed the carbon quota then, in theory anyway, you can not emit any more carbon or you can buy some carbon credit from individuals who don’t really need to emit carbon so much or better from entities that plant trees and so on to reduce carbon. In effect carbon is now a unit of account sort of thing and it is a pretty big business with billions traded in carbon credits. Through an app, with blockchain stuff and the rest on the backend, they claim to tell you how much carbon you have emitted when say you buy a banana or a pair of shoes. As someone who at the very least likes clean air, and perhaps more so wants climate change to not run away, you buy some carbon credit from the tree planters so neutralizing your carbon emission. Poseidon says in their whitepaper this can be integrated with Points of Sale systems, so if you please all this offsetting can be done automatically. You can even buy credits if you want as a donation sort of thing to support a cleaner environment, with it done through an Ocean Token which is currently ICO-ing that will use some of the proceeds to fund these tree planting like projects. 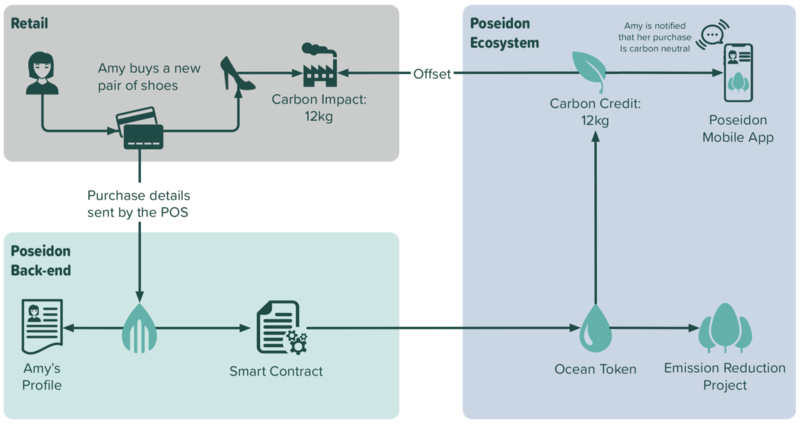 The blockchain itself is mainly used to address a double spending problem in carbon credits. That is where you plant a tree, giving you say ten credits, which you sell to whoever, and then turn around and sell it to whoever else sort of endlessly. In the blockchain system, in theory anyway, you only get the ten credits once because then everyone knows it is spent. We say in theory because blockchains are perfect in verifying things that are already on the blockchain, or any digital thing really, but has the same problems as anything else where it concerns external inputs of physical events. That is, in a blockchain system at the data inputing point you can say there is a tree, and they can say here are 10 credits, and now this ten credits can’t be double spent. But whether there is actually a tree, that’s a human matter where the blockchain can’t help. What would be very interesting and easily doable in this sort of set-up is public authentication. That is we have, in an illustrative example, Poseidon that says there are 10 credits as there is a tree, and then we have an independent verifying agency that says, yup, we looked at the tree, it is new, it exists, all clear, and signs with their private key. Obviously we’re humans, so there can be no perfection. The private key can be stolen and so on, but arguably in a non-blockchain system you can’t have such public authentication or it can’t be as potentially open and free market based as a blockchain public authentication system can be imagined. And you do need that verification because as we say blockchains aren’t inspectors going around looking at the trees which we are using symbolically as carbon reducers. That is, we do not know if Poseidon did in fact plant a tree, metaphorically speaking of course because there can be other carbon reducing things they can do. Nor do we necessarily know whether they are giving or taking valid credits and so on, because the credit has to be typed in there by a human who of course could well be lying. But what we do know is that the credit, which may or may not be true, once spent is actually spent. That is to say many of these potential problems we have pointed out exist in all systems and the blockchain can not assist there, therefore there needs to by systems and so on to deal with it as in any system, but there is something that the blockchain can offer and that is certainty after the data has been entered. In a centralized database, and in this set-up, for it to really be trusted, you of course need authenticators and so on who go out to the trees and say, yup, there is a tree here, input 10. The problem is that 10 is now in a database the administrator can change as he likes and inputs 1 or 100. Moreover, if he wants to he can change the database to say the 10 was spent when it wasn’t, or wasn’t spent when it was, or worse he can corrupt the database completely. In a public blockchain setting, all or most of the problems end when that ten is entered on the blockchain. Thereafter, there can be no doubt that it is a 10, and not a 100, and if it is spent that it is spent. Making this use case somewhat interesting. It is of course early days and plenty needs to be refined, but if rose glasses are taken out and we clearly see, and thus clearly see what has to be done, there is some considerable improvement. For such considerable improvement to really be felt one needs scale or network effects, one needs many people to use it and to jump on it, so this backing by Liverpool City may mean a lot more than one initially thinks.